A soft round sea animal that you can see through. Many types of jellyfish sting if you touch them. 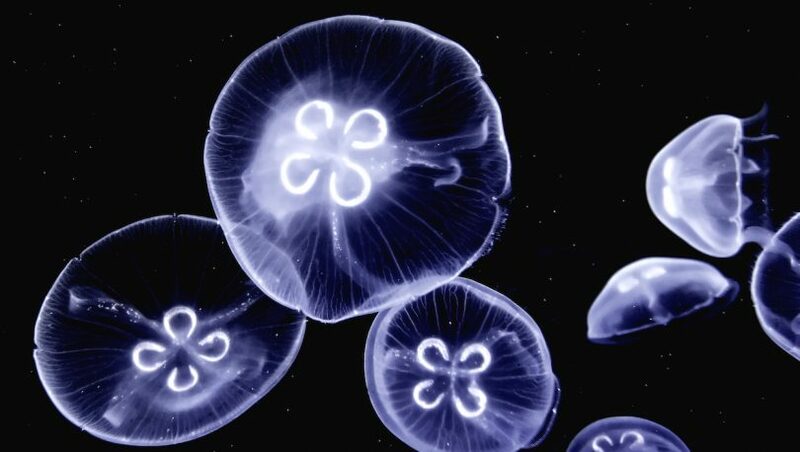 The word jellyfish comes from the nouns ‘jelly’, from the Latin word ‘gelare’ meaning ‘congeal or stiffen’, and ‘fish’, which has origins in the Proto-Indo-European word ‘pisk’ meaning ‘a fish, animal that lives in the water’. Jellyfish has been used since about 1796 to describe a particular kind of soft-bodied sea creature. The word jellyfish refers to an animal that lives in the sea and has a round, soft body with many tentacles. They do not have a backbone, which is why sometimes the word jellyfish is used to describe a person who is weak or timid. There are many different kinds of jellyfish found in oceans all over the world. Jellyfish don’t swim because they don’t have arms or legs or fins; they pulse their round bodies and tentacles to propel themselves forward and spend a lot of time drifting along with ocean currents. Jellyfish eat fish, crabs, prawns and small sea plants. They use their stinging tentacles to stun or paralyse their prey, then use the tentacles to move their food to a small mouth opening on the underside of their bell-shaped bodies. Some jellyfish are quite beautiful, with long, trailing tentacles that look like ribbons. Many are vibrantly coloured and some jellyfish even glow in the dark!